Set in 1950s Sudan, Lyrics Alley is the story of the powerful, sprawling Abuzeid dynasty. With Mahmoud Bey at its helm, the family can do no wrong. But when Mahmoud's son Nur - the brilliant heir to his business empire - suffers a near fatal accident, his hopes of a glittering future are dashed. As the sun sets on the British rule, Sudan is torn between modernising influences and the call of traditional past. Mahmoud's first wife is confined to her open-air kitchen, while his second , a modern Egyptian woman, is intent on dividing the household. And against the backdrop of this tension, Nur must rebuild his life, confronting a future in which he cannot marry his beloved cousin, Soraya. Moving from the dusty alleys of Sudan to cosmopolitan Cairo, and a decimated post-war Britian, this is a heart-wrenching portrait of faith, redemption and history on the move. 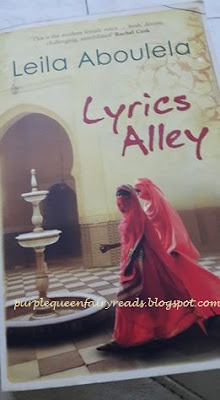 Lyrics Alley was one of the books I inherited when a friend migrated back to her home country. I wasn't sure if I would want to read it so I left it at my TBR pile for quite a while. It wasn't until recently that I thought I needed something different and Lyrics Alley fits the requirement. I am so glad I read it. It's really a hidden gem. The story is about the family of Mahmoud Bey and his family in Sudan. Mahmoud has two wives, one traditional and one modern. Mahmoud has two sons, one poetic and brilliant and exposed to the modern western world and the other is the other side of the pole. There are many others in this big family, Soraya, who is the daughter of Mahmoud's brother who is in love with Mahmoud's poetic and brilliant son and who's sister is married to the other brother. It took me a while to get round who's who and the family tree at the start of the book does help. The story was rather sad in certain way but uplifting as well. It's about lost and gain, about give and take and about making the best of a situation...but at the end, it's about hope.